This winter, Anthem Press will publish their second book, Philology and Criticism: A Guide to Mahābhārata Textual Criticism. 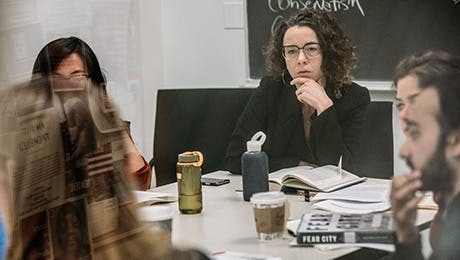 To mark the occasion, Research Matters presents excerpts of Adluri's conversation with Philosophy Professor Alice Crary. They talk about Adluri and Bagchee's first book, The Nay Science: A History of German Indology (Oxford University Press), the practice of reading and interpreting texts and a history of Indology. Indology-the academic study of India-originated in Germany and served as a foundation for western academic interpretations of Indian texts and traditions. The Nay Science charts the history of German Indology to show how the nascent discipline was rooted in troubling philosophical assumptions that generated inaccurate readings of the culture it was studying. Against stubbornly persistent biases, Adluri and Bagchee write in favor of a more sincere reading of ancient and Eastern texts-a kind of “innocent reading” that goes beyond a postcolonial critique-that might enable us to meet texts outside the Western Christian tradition on their own terms. Alice Crary (AC): The occasion for this interview is your magnum opus, the 2014 monograph written with Joydeep Bagchee, The Nay Science: A History of German Indology. I want to sit with you and talk about its significance and implications. I thought we should get some background first-who you are and what you have done since your time at The New School for Social Research's (NSSR) Philosophy Department. Can you tell us a bit about your life and your intellectual work at NSSR and afterwards? Vishwa Adluri (VA): Thank you, Alice. I went to The New School where I got my first PhD for a dissertation on ancient Greek philosophy (since published as Parmenides, Plato and Mortal Philosophy). After that, I continued my work in ancient Greek philosophy (I published an edited volume titled Philosophy and Salvation in Greek Religion in 2013), but also branched out into Indian philosophy. My education at The New School sensitized me to the need to ponder the conditions of modernity. My teacher and mentor Reiner Schürmann had the greatest influence on me. In Broken Hegemonies, Reiner describes modernity as a project grounded in an inward turn toward self-consciousness as the primary referent for all knowledge. He calls self-consciousness “the modern hegemon,” and describes how it conditions our relationship to the world and ourselves. I began to see how, when we approach the ancients-ancient Greeks, for example-or other civilizations, we automatically subject them to our prejudices as moderns, as Europeans and as post-Enlightenment. I wanted to investigate this problem in a different field. I turned to “Indology” as a test case to study the influence of method on a non-Western episteme. About the same time I met a fellow NSSR student who was living and studying in Berlin. Working together, we mapped the emergence and decline of this field. The resulting book was published by Oxford University Press (OUP) in 2014. OUP India released a South Asian edition last month (August 2017). We were humbled by the enthusiasm among scholars whose work we read and in turn admired (Richard Wolin, Bryan W. Van Norden, Peter K. J. Park, Susannah Heschel, Arbogast Schmitt, Edward P. Butler and Robert Yelle). But we were simultaneously traumatized by the disciplinary force contained in academic disciplines, facing enormous resistance for talking about things as obvious as the link between Orientalism and anti-semitism. VA: I was working with Arbogast Schmitt on Greek philology at Marburg. I had contacted him because he had written a wonderful book, Die Moderne und Platon, that I wanted to translate into English (my translation appeared as Modernity and Plato in 2012). His ideas resonated with what I had learned from Reiner. Like Reiner, Arbogast had rethought the relationship of the ancients and moderns. He has this wonderful phrase, “Die ganze Arroganz der Moderne,” which defines our attitude not only to the past but also to cultures labeled “pre-modern.” Arbogast knew I was interested in the Sanskrit epic, The Mahābhārata, which I had been reading alongside my work on Homeric epics. Taking Nietzsche's and Reiner's cue, I had looked at the pre-Socratics and Plato in relation to Homer. Arbogast knew the Indology professor at Marburg and he introduced us quite casually over a glass of wine. The professor, Michael Hahn, suggested I turn my writings into a dissertation under his and Arbogast's guidance; a pilot project for collaboration between their departments (classics and Indology). Back then-remember I was Seth Benardete's student and came from classics-I could not have known the problems with so-called Indian philology or Indology. What they presented in the name of a “critical” philology was anti-semitic and anti-Brahmanic resentments, theological maxims and racial prejudices (about ancient Aryans, Indo-Germans, etc.). VA: Yes. The racism I encountered in Marburg was not the kind we see among the “alt-right” or the discrimination black and minority citizens face daily. That kind of racism is easier to spot and to call out. This was more insidious. It was scientific or scientized racism. The Indologists had for so long told themselves that Indians lacked access to the “true” meaning of their texts that they no longer considered it a prejudice but a methodological principle and a necessary one at that. The question was, “How do we approach these texts scientifically and critically?” The answer was, “Obviously not as Indians read them, for Indians never developed scientific, critical thinking.” Apart from the fact that, except by skin color, I am not Indian-I have lived and studied in the US most of my life, have a PhD in Western philosophy and know German intellectual history inside out-I was not approaching the Sanskrit epic in a “traditional” way. I was reading it alongside Homer and the tragedians. I knew the scholarly literature, had presented at the American Philological Association (now known as the SCS) and was offering a cogent interpretation. Yet, whenever I opened my mouth, the Marburg Indologists could only hear an Indian, and thus, whatever I said had to be negated to maintain Indology's status as a science. And then I realized: scientism and racism are linked. Indologists enact this discrimination not because they are vulgar racists-obviously, they think they are cultured, enlightened and cosmopolitan-but because their authority depends on it. This triggered my deconstructive project: whence these prejudices? Why this insecurity? Why this need to prove oneself “modern” by disparaging the ancients? The popular view of the Enlightenment is that it overcomes theology. But this is hardly accurate. The German Enlightenment, especially, was ambiguous about religion. There was a strong Pietist influence (think, for example, of Thomasius and Zinzendorf). Kant famously declared, “I had to deny knowledge in order to make room for faith.” (CPR Bxxx) The Indologists' own work emerged from Protestant debates over scripture (sola scriptura, the emphasis on the sensus litteralis sive historicus, Semler's Kanonkritik). Do you see the problem with preaching to an NSSR graduate about having overcome theology? Whence this arrogance? And then I realized that the supersessionism inherent to modernity itself underwrites the Indologists' arrogance. The Indologists really believe it is their mission-as Europeans-to teach Indians to receive their own texts correctly and “critically.” There is now a narrative about history as a progression from the darkness of religious belief to the light of reason. Europe, having exited religious superstition first, has a privileged status. Other cultures must look to it for guidance, as they are-allegedly-on the same path. Husserl can now declare that “the spiritual telos of European Man [includes] the particular telos [sic] of individual nations.” Notice the provincialism, the reduction of other cultures to one's own. Notice the negation and subsumption of ancient cultures. Everything they thought is only preliminary. And finally, notice the disparity instituted. Europeans are mündig (mature), whereas non-Europeans are unmündig, and hence candidates for (Um)erziehung ((re)education). I wish us to hear this word with all the disciplinary force inherent in it. At stake is an Umerziehung, rather than an Erziehung des Menschengeschlechts (in the spirit of Lutheran theology and its specific Menschenbild). AC: Heidegger just came up, but Gadamer plays a big role in the project also. It is a positive role and he is Heidegger's heir. As I understand it, Heidegger plays an ambiguous role here. Is that right? Can you explain why Heidegger and Gadamer appear in different ways? VA: Heidegger's role is ambiguous because, while he has profound philosophical insights, he also buys into “Germanness.” In several passages, he declares that philosophy is uniquely Greek, European and German. The Germans are the true inheritors of this legacy and the German language is the philosophical language par excellence. Germany has a role to play in the destiny of the Occident by recapturing the true meaning of Being (Pauline, not Greek). Studying Indology opened my eyes to how Germany, after Kant and Goethe, laid exclusive claim to the idea of thought and scholarship. I saw how, through this ideology, people from rather humble backgrounds, first-generation school-goers, began to dominate the reception of ancient thought. I saw how, through the Humboldtian university, they injected Protestant prejudices into other textual cultures. I saw how, out of their provincialism-what Germans call Deutschtümelei-they arrogantly declared that those cultures had failed to grasp their own texts and only Germans, or German-trained scholars, could interpret them. Gadamer is alert to the problem. In Truth and Method, he expands Heidegger's hermeneutic circle to an a priori condition of interpretation. He shows that all understanding is historically mediated. The idea of “presuppositionlessness” (Voraussetzungslosigkeit) arises from the Enlightenment prejudice against all prejudices. But it is no less prejudicial. The genuine meaning of prejudice is not an unjustified prepossession but a pre-understanding (Vorverstehen). Without this pre-understanding, no understanding is possible. Every interpretation therefore must engage with past interpretations (that is, with the text's Rezeptionsgeschichte). The Indologists systematically overlooked this fact. They modeled themselves on the natural sciences, forgetting Dilthey's distinction-indeed, if they ever knew it-between Geisteswissenschaften, which aim at understanding (Verstehen), and Naturwissenschaften, whose goal is explanation (Erklären). This is why we ultimately took the critique of Indology towards a discussion of the methodology of the social sciences (the title of a lecture course by Reiner in the Schürmann Archives). Contrary to what the Indologists may think, the book is not just about them: it is a nuanced critique of “method” in the humanities. VA: Outside Indological circles, the book received strong reviews. We had fantastic responses from classicists, who saw it as continuing Nietzsche's legacy. We had fantastic responses from philosophers-including a fellow New School alum-who grasped its Foucauldian archaeological-genealogical project. A reviewer for History of Religions wrote that we had “hoist[ed] earlier Western scholars by their own petards.” I must confess, I had to look up the expression. A petard is a small bomb (from French peter, meaning “to break wind”; pet “the expulsion of intestinal gas”). And this is quite appropriate because, essentially, we just translated everything the Indologists had said into English. More exciting, the book created waves in fields we least expected; fields like German studies, history and even Jewish studies. I received an email from Susannah Heschel, who wrote, “I want to thank you and Joydeep Bagchee for your hard work and remarkable insights. The book is real gem.” Susannah is Abraham Joshua Heschel's daughter, whom I read as a religion undergraduate. It was very gratifying. In a way, I felt I had come full circle. The Nazi legacy tormented Reiner his whole life. By tracing what he calls those “distant and profound origins,” (Broken Hegemonies, 3) I felt I had repaid my debt to him. VA: That is very perceptive. The book does not just present a critique. Through its backstory, it also enacts a critique. It illustrates how we must question established paradigms. Critique cannot be only historical, but must be directed against existing institutions. Remember that Foucault said, “Schools serve the same social functions as prisons and mental institutions-to define, classify, control and regulate people.” I would like to throw a challenge out to NSSR students: how does our institutional framework-the research university, the dissertation refereeing past research, the encyclopedic tome, the reverential relationship to German scholars, the Eurocentrism exhibited, for example, in Husserl's Vienna Lecture-limit what we think? They should read not just the primary figures, but should also study their historical context: issues in German political and social life, how figures like Hegel were embedded in a specific religio-philosophic context. They should read critiques of the university (Nietzsche's “Anti-Education” and Arrowsmith's “The Shame of the Graduate Schools” are good starting points). The Nay Science let me emancipate myself from an idealized vision of Germany. Meeting Indologists was a wake-up call. I saw behind the façade and beheld racism, supremacism and chauvinism. Everyone studies Hegel at The New School. But how many actually experience the systematic othering the Hegelian narrative effects? How many will perceive the absurdity of declaring that ideas that arose in Germany at a specific moment and have their historical reasons are the telos of world history? Indology was my second education. It forced me to rethink everything I knew about the Enlightenment and German philosophy. I returned to Herder, Schlegel and Hegel with new eyes, and saw they had betrayed Kant's and Humboldt's legacy. Positively, I learned about what you called the ethical dimension of interpretation. I saw that we must respect what others respect and not perform autopsies on the ethical spinal cord of living cultures. I saw that the university's arrangement into area-specific disciplines reifies cultural boundaries, ethnicity and race. I saw that this structure was itself “disciplinary,” since it gathers every culture into the university and lays it bare to the viewing of a master gaze in the same way museums of natural history gather animal and human specimens. And I saw that my narrative could no longer fit this paradigm. I was neither eastern nor western, neither German nor Indian, neither modern nor traditional and neither religious nor a participant in modern iconoclasm. I had exploded the Indologists' categories. VA: We reconnected in Berlin after many years. He had gone to Germany to study Heidegger in Berlin and Freiburg. And after three years, he became extremely frustrated with the German system-its cult of the God-professor, the endless posturing and the lack of dialogue. He was about to quit because he really cared about philosophy. I went to Berlin, and when I read his dissertation, I realized his was not an ordinary mind. He was wrestling with genuine philosophical questions. I later realized that Joydeep is very logical. In his dissertation, he was trying to reconstruct Heidegger's grounding of Dasein in facticity, and he had this sense of circularity. I always say that he broke Heidegger's hermeneutic circle. I see him as Reiner's successor, so he has been my greatest conversational partner after Reiner. AC: A related philosophical question, since you just described Foucault. I think it comes out really clearly that this is what the book really does: it provides the resources or methods to critically dismantle a discipline. Foucault is also brought to bear in many other people's work, positively, to describe the kind of self-awareness and methods one needs to positively approach a text. Listening to the references to his writings on these topics and the things you just said, it strikes me as one of the most interesting things about your project is that you do not recommend a skeptical moral about our relationship to texts. VA: The Nay Science argues for a new way of reading texts-call it innocent reading. I am thinking of Deleuze's quote, “If you don't admire something, if you don't love it, you have no reason to write a word about it.” In their quest to prove Indian texts monstrous, false and debased, the Indologists forgot this basic qualification. They advocated a historicist approach, aware it would frustrate the texts' ability to address the reader. From their perspective, this was essential. They wanted to insert themselves between the reader and the text. Having historicized the texts, they could claim the reader needed their expertise to decode the texts' historical layers and lay them bare in their primitivity. Does this not apply to the Indologists? Did not their literary productions-the purified versions of the transmitted texts they proposed-result from their “buggery” of the ancients? The Nay Science opposed this perverted, self-serving reading to the texts in their immediate presence. You do not need the Indologists, or their degrees, or their permission, to read texts. Pick up a work of literature and read it. VA: What has been the single greatest obstacle in reading Indian philosophy for the past two hundred years? The conviction that India did not develop philosophy, that everything we call philosophy is really only “religion.” This conviction is false and prejudicial. Indian philosophy is rigorously logical. It is based on the principle of noncontradiction. It developed sophisticated systems of debate and criteria for validity (including a critical epistemology). The separation of theology and philosophy did not happen in Europe itself until the Reformation. When we accuse Indian philosophy of being “religion,” we apply a post-Reformation prejudice (here religion, which is a matter of faith; there philosophy, which was hubristic with the Greeks and uncritical with the Scholastics, but is now limited to self-reflection or critique and, importantly, cannot say anything about God, the soul and the universe). The allegation serves to negate a potential challenge to Christianity. This prejudice can be traced to Hegel, who largely fashioned the Western image of India (India only developed an abstract Absolute, it lacks a historical sense, it does not know of concrete individuality, etc.). Hegel's aim was to head off the challenge from Indian philosophy to his Lutheran faith. Remember, Hegel said, “I am a Lutheran, and through philosophy have been at once completely confirmed in Lutheranism.” And again, “We Lutherans (I am and will remain one) have a better faith.” Hegel's entire philosophy thus serves to justify Protestantism and the Prussian state. The university is the link between them (Hegel knew this in saying, “Our universities… are our churches.”). Hegel's Protestantism is now well known and the Prussian state has collapsed. Nietzsche has exposed the link between philosophy, Protestantism (“The Protestant pastor is the grandfather of German philosophy, Protestantism itself is its peccatum originale”) and how the humanities and philology, in particular, serve to neutralize the threat from ancient thought to Christianity (from Wir Philologen: “The philologists are… ardent slaves of the State, Christians in disguise [and] philistines”). When, then, have we not revised our judgment about Indian philosophy? One reason is the university's inherent inertia. Once Hegel rejected Indian philosophy and parceled it out to departments of Religion and Indology, Philosophy never reclaimed it, partly because of its own Christian inheritance and partly because of its Eurocentrism. We would rather study Hegel, who needed the resources of the Prussian university system to preserve his fame (“Verein von Freunden des Verewigten”) than look at Indian thought afresh. Indology draws sustenance from this snobbery and contributes to it. By dismantling Indology, The Nay Science lets us reclaim Indian thought; to read it as contemporaneous rather than as a stage of thought that Spirit allegedly bypassed on its way to Germany. AC: Is there anything further you want to say about the project's wider consequences, including political ones? VA: We have seen the problems that result when academics play politics. Consider, for example, Bernard Lewis's role in the Neocon movement. American intervention in the Middle East was disastrous. Likewise, the Indologists, having failed at an epistemic justification, have turned to politics. It is their last hope for their chairs. The Nay Science did not address this because we are disinterested in politics. But we know the danger power-hungry sophists represent. Instead of sticking to grammar, the Indologists turned to policing and petitioning. They wish to ride a wave of self-righteousness without questioning what they do, whom they serve and how they use or misuse their authority. Why should taxpayers fund them if they do not serve society? VA: We sometimes call Philology and Criticism The Nay Science:Part 2, even though it is a book of a different nature. The Nay Science presented a genealogy of German Indology. It returned to Indology's roots to understand its emergence from neo-Protestant theology and its anti-clerical prejudices. The Indologists' justification has been that Indology is neither theology nor religious studies. It is indebted to neither Romanticism nor Aryanism. It neither supported nor fed into German nationalism. We are simply editors and preservers of texts; we do for Indian texts what classicists did for Greek and Latin texts. We thus had to show that the Indologists did not know textual criticism. Philology and Criticismexamines post-critical Mahābhārata scholarship. It shows that on the pretext of respecting The Mahābhārata's critical edition the Indologists reintroduced their anti-Brahmanic prejudices (found, for example, in the work of the anti-semite, Christian Lassen). The book contrasts V. S. Sukthankar's careful philology with the Indologists' pseudo criticism. It distinguishes between philology as a method, which is needed, and philology as a discipline or a slogan. I am thinking of Sheldon Pollock, who has never produced a critical edition but argues that the textual practices of non-Western cultures must submit to the tests of “historical self-awareness,” “nonprovinciality” and “methodological and conceptual pluralism” before they can be admitted to the “temple of disciplinarity [sic].” Philology and Criticism shows that Pollock himself made unforced philological errors. One wonders, why make these statements in favor of philology, if you have not mastered the method? Are they not another form of Wissenschaftsideologie, the writing of manifestos for the future university? How much intelligence does it take to write pompous statements? University history is littered with those who made their careers writing them. Husserl's Vienna Lecture is an example. How did that turn out for Husserl? VA: Do they stay up at night worried about philosophy? Even if there is no prospect of a job, will they still do it? A job is necessary and important but it is not the only thing. The other thing I would say is that the big dream they see as graduate students, the glorious dawning of truth, has a price. You have to read every single thing, struggle your whole life to claim the life of an intellectual. If they are competent-perhaps competent is not the right word-if they can hang on and do the work, there is no greater reward than philosophy. EDITOR'S NOTE: The original text of this article has been revised and re-posted to reflect necessary changes made by Vishwa Adluri. Questions can be addressed to nssrcommunications@newschool.edu.